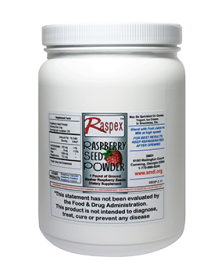 Raspex has established itself as one of the leading suppliers of Meeker Raspberry Powder, Capsules and Skin Creams to Doctors, Chiropractors, Health Food Stores, Cancer Clinics, Consumers and manufacturers worldwide. In business since 1993, they bring together professionals dedicated to improving health and quality of life. 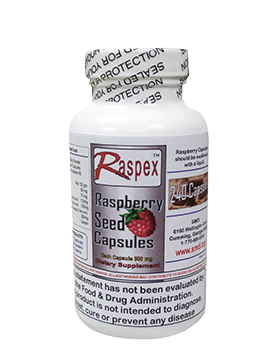 "A Proprietary Blend of Raspberry Extract"
Raspex Raspberry Seed Capsules (240 capsules) contain 500 mg of the same valuable Raspex Raspberry Seed powder in capsule form and is much easier to take - simply swallow several capsules. Raspberry seeds contain Ellagitannins which are one of the most powerful antioxidants known. The bioavailable raspberry seed flour frees the Ellagitannins for immediate adsorption in the stomach into ellagic acid. Ellagic Acid has been found to inhibit the promotions and progression of many cancers by keeping the cancer cells from dividing and multiplying. Ellagitannins can also lead to cholesterol reduction and other benefits such as slowing gum recession and weight loss. Excellent for "body maintenance". 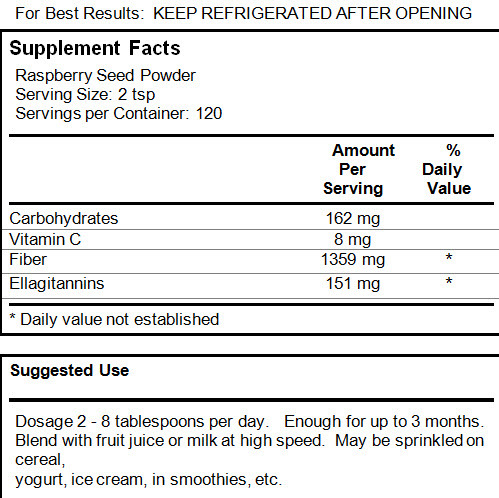 "Meeker Raspberry Seeds" which are ground into a fine bioavailable powder, are the best, most concentrated, natural source for Ellagitannins (and other beneficial phenolic complexes) which break down into Ellagic Acid and is the only fruit that has clinically been shown to be transformed into beneficial levels of Ellagic Acid in the body. The Ellagic Acid fights many kinds of cancer including esophageal, breast, prostrate, colon, skin, etc and can be used to help control diabetes, weight, tumors and cholesterol and are anti fungal/anti bacterial. The American Cancer Societie's book "Complementary Alternate Cancer Methods Handbook" says Ellagic Acid may reduce heart disease and promote wound healing. The Meeker Raspberry Seeds are the most concentrated source of this beneficial phenolic complex." The Ellagitannins content of raspberry seeds varies dramatically with the variety of the berry. The highest levels of ellagitannins are found in the Meeker variety of raspberry. Raspex selected a processor who guarantees us greater than 90% Meeker and are willing to actively control their raw material stream to satisfy our strict nutraceutical requirements. The seed is then processed into a maximum bioavailable flour which frees the Ellagitannins for immediate adsorption and transformation into Ellagic Acid. Dosage 2 - 8 tablespoons per day. Enough for up to 3 months. yogurt, ice cream, in smoothies, etc. Recommended Dosage: Based on Dogs Weight: 1 tablespoon per 20 lbs. Rub this cream on pre-cancerous spots or even skin cancer. No pain. No Scarring. The Raspex Skin Cream contains Ellagitannins from the Meeker Raspberry Extract and is effective against burns, age spots, moles, warts, rosacea, rashes, poison ivy, etc. Boosts the skins immune system, maintains the skin suppleness, promotes healing, reduces scaring and improves fine capillary blood flow. Rub this cream on pre-cancerous spots or even malignant growths. No pain! No scarring! The Raspex Skin Cream with SPF 30 (UVA & UVB) contains sun block and helps protect against sun burns. It can actually reverse sun damage if applied within four hours of the burn. The Raspex SPF 30 Skin Cream contains Ellagitannins from the Meeker Raspberry Extract and is effective against burns, age spots, moles, warts, rosacea, rashes, poison ivy, etc. Boosts the skins immune system, maintains the skin suppleness, promotes healing, reduces scaring and improves fine capillary blood flow.